Former NFL player Aaron Hernandez has appeared in a Boston court for a pretrial hearing ahead of his double murder trial in which the judge has ruled the jury can see tattoos that may link him to the crime. 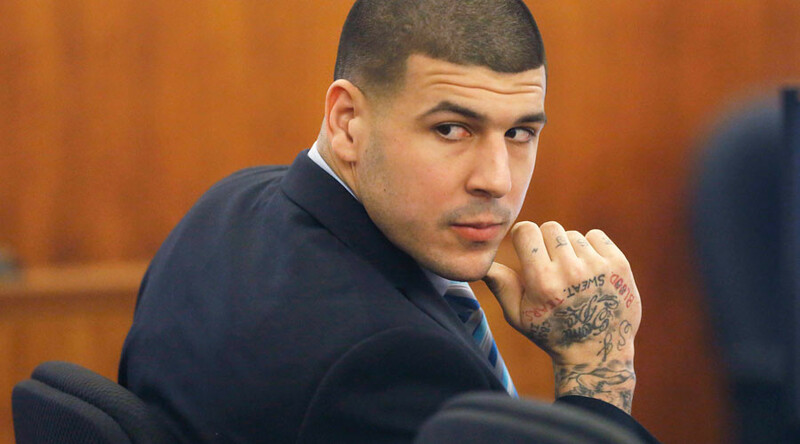 Hernandez, who was a star tight end for the New England Patriots prior to his arrest, appeared at Boston’s Suffolk Superior Court on Thursday for a pretrial hearing ahead of his trial for the 2012 double murder of Daniel de Abreu, 29, and Safiro Furtado, 28, in Boston. Prosecutors allege the pair were gunned down when Hernandez followed the men and opened fire on their stationary car, after a confrontation that arose from when the two bumped into Hernandez at the Cure Lounge nightclub, causing the 27-year-old to spill his drink. Hernandez has pleaded not guilty to the charges. The judge presiding over the case, Superior Court Judge Jeffrey Locke, ruled tattoos that could link Hernandez to the slayings can be seen by the jury. They include a cylinder of a revolver with one empty chamber and five live rounds. Underneath are the words 'God Forgives,' written backwards so it can be seen while looking in the mirror. During a motion hearing in December, Assistant District Attorney Patrick Haggan detailed the tattoo as one of three he said suggest the former Patriots star may have meant as a memento to the murders. Haggan contends Hernandez adorned himself in tattoos that serve as trophies to the 2012 drive-by shooting, the Boston Herald reported. According to ballistic reports, there were five rounds fired at the victims. The judge ruled this week that prosecutors will be able to let the jury know of tattoos they claim relate to Hernandez’s alleged crimes. Hernandez, originally from Bristol, Connecticut, is currently serving life in prison without the possibility of parole after being convicted in 2015 of the murder of semi-professional football player Odin Lloyd two years prior. 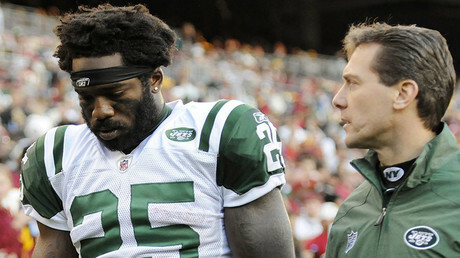 He was drafted by the Patriots as the 15th pick of the fourth round of the 2010 NFL draft. At least one team told ESPNBoston.com that it had moved him down its board because of "off-field concerns." Hernandez won the John Mackey Award in 2009, an award given to the most outstanding tight end in college football, while at the University of Florida. His former team is vying to win this year’s Super Bowl. They play the Pittsburgh Steelers in the American Football Conference (AFC) championship of the NFL playoffs on Monday at Gillette Stadium, Foxborough, Massachusetts. The winners of that game will play the winners of the National Football Conference (NFC) championship between the Green Bay Packers and the Atlanta Falcons, played on Sunday. The Super Bowl will be played at NRG Stadium in Houston, Texas on Monday, February 6.